There are some projects you just know are going to be exciting. Not necessarily easy, and not necessarily not-stressful, but you know it will be worth it. A flash of inspiration: why not use CHS? It has a brilliant acoustic, perfect for one of Oli’s compositions, not too much background noise (from motorways or airports), plenty of space for all the musicians and equipment… As I worked there, I was in the perfect position to get things moving. So, we set about negotiating the details, and before too long we were all set to go. Led by the magnanimous Manvinder Rattan, Oli, Adaq (the sound engineer) and Dom (sing for pleasure), the admin team for this project continued to grow as we got it off the ground. I was already heavily involved in the recording on the logistics team, but I was thrilled to be asked to sing the Soprano solos as well. The music was so interesting, I couldn’t WAIT to get a good look at the score! What’s more, Oli was using the texts in the scriptures that had inspired the Magnificat: exploring how Mary would have reacted aged 16 (!) to the news that she was to give birth to the Son of God: the fear and doubt; how her betrothed would feel; how the community around her would cast her out… The story was as alluring as the music. I was curious to learn as much as I could about the inspiration for the texts Oli had chosen and how that influenced his music. The preface to the score can be downloaded from his website and I would urge you to give it a read. Through an amazing effort and the immense generosity of family and friends, we managed to raise the funding required to secure the recording project. READY, SET – GO! 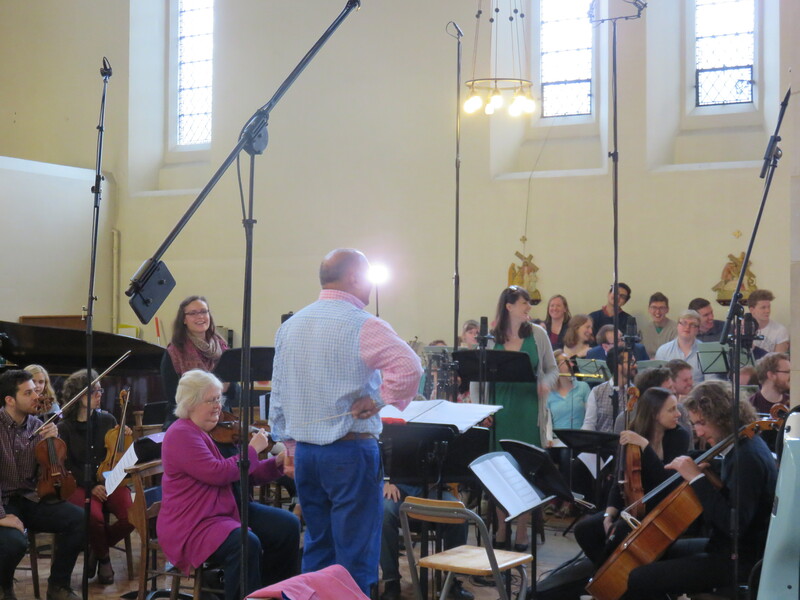 10am Saturday 24th May: all the musicians are present and correct (except the wonderful double basses, who were en route from POLAND. Yes. Poland.) We worked tirelessly until 8pm on Saturday and got a good amount of the material ‘on tape’. As many of us as could make it then sang the next morning in the Pentecost Eucharist and recording began again at 12.30 on Sunday 24th. We had to get the rest of the work down by 6pm that night. But we still had a lot of music to get through, and a very high standard of performance to reach… We were all genuinely trying to work out if we would make it…. By 5,59pm we had DONE IT. Baton down, huge smiles, applause, big hugs and RELIEF. 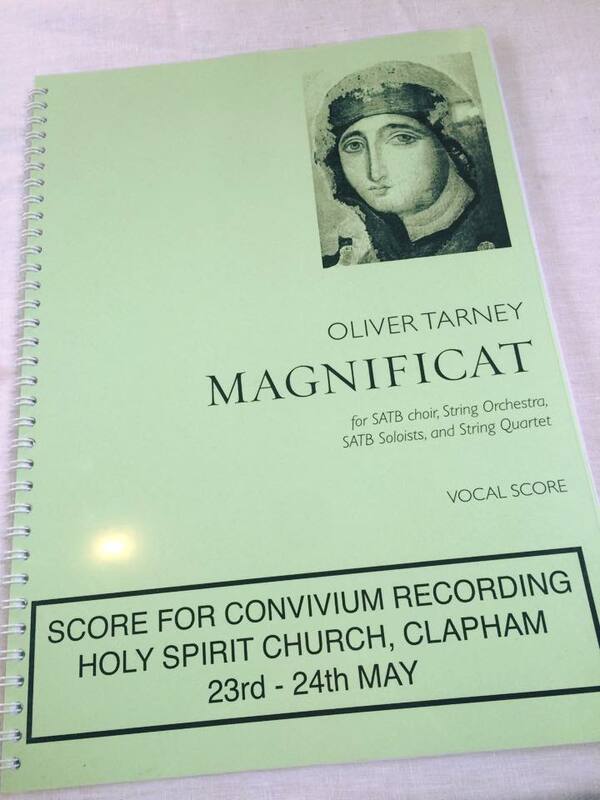 The Tarney recording project was all-consuming, even though I was just a small cog in a much bigger wheel, but it was SO rewarding. Musicians that were no more than colleagues at 10am on Saturday, were good friends by 6pm on Sunday. Each and every performer in the ensemble was determined to get the best possible result: for Oli, for Manvinder, for each other. I can’t wait to hear the finished product. Details on how to get hold of your copy will be available in the Autumn!